According to the ArtDaily, social media users in Africa had led outrage over the montages, including one showing an open-mouthed African child alongside a monkey in the same pose, and another showing a black adult man baring his teeth alongside a photograph of a lion. 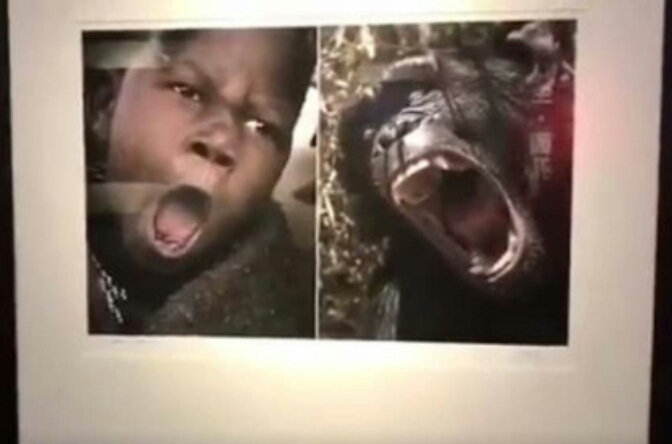 Following the complaints, a dozen offending works were removed from the exhibition called "This is Africa", which has been showing for three weeks at the Hubei Provincial Museum, in the central Chinese city of Wuhan. "To show our goodwill and sincerity, we have replaced the photos that our African friends find shocking," curator Wang Yuejun told AFP. The exhibition contained 150 images by photographer Yu Huiping, who has visited Africa many times and "greatly loves" the continent, said Wang. In creating his collection the photographer was simply trying to "show the harmony between man and animal in Africa", the curator said. "There is no discrimination at all in this."